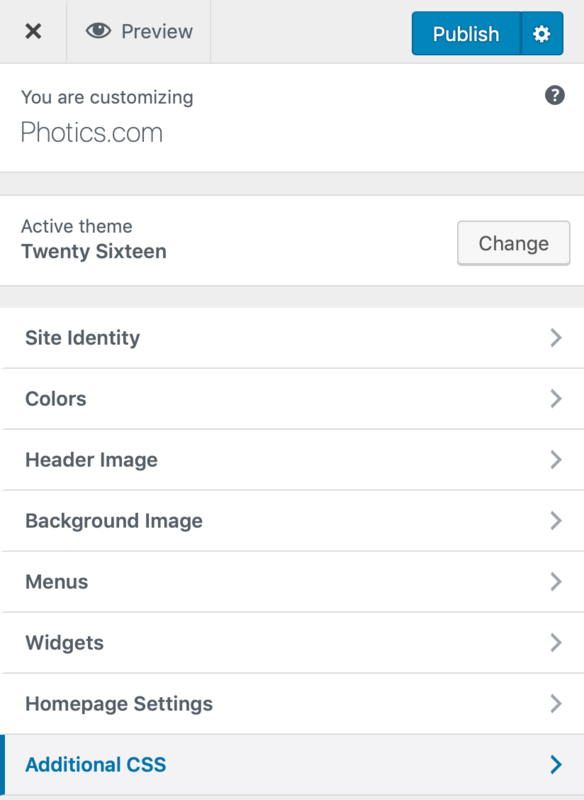 Photics.com runs on WordPress, with the “Twenty Sixteen” theme. What’s nice about WordPress is that it’s very easy to add custom CSS to a theme. From the “Appearance” section of the WordPress Admin Menu, select the “Customize” option. The website should go into an editor mode. New options should appear on the left side or top of the screen. (The location depends on the width of your browser window.) At the bottom of the list, select the “Additional CSS” option to add additional CSS. While I might not be impressed with Gutenberg, I really like how WordPress handles theme customization. It’s really easy to add some more CSS. It’s so straightforward. You can even see how the changes will affect the page in realtime. The CSS editor is powerful too. It even has syntax highlighting, autocomplete and error checking. To add dark mode support to a website, it’s essentially involves adding a media query. All I had to do was add the “prefers-color-scheme: dark” media query, then nest all my custom styles inside. The instructions are simple. The tedious part is going through all of the classes and adding Dark Mode styles. That’s why WordPress was exceptional for this task. With Safari’s web developer tools, I could use the inspector to pinpoint the exact styles that required updating. With the live editing of CSS in WordPress, I could see exactly how the changes looked. So easy right? If that’s not easy enough for you, included in this post is the code I added to Photics.com. If you’re running WordPress and the Twenty Sixteen theme, this CSS could be a great starting point for adding Dark Mode support. Update (April 7, 2019) – I don’t really like the look of Dark Mode for this website. I switched it back to normal.